Fly Free Food Supplement for Large Animals ~ is an all natural effective fly, flea, mosquito, mite, lice, gnats, and other blood sucking insect control remedy for large animals - horses, goats, cattle, hogs, and pets such as dogs and cats. Fly Free is an all natural way to repel flies, fleas, and mites without using dangerous traditional flea and mites preventative poisons. Fly Free will NOT harm you, your animals, or pets, or the environment. This natural Fly Free supplement is added to your horse, goat, cow, dog, cat, or other animals food or water and goes to work internally in the blood stream and emits an enzyme which shields the protein the female fleas need to lay eggs. Not sensing a protein, she will jump off the pet and search for another blood meal because if she doesn't draw blood every 20 to 22 hours she will die. Males never bite. 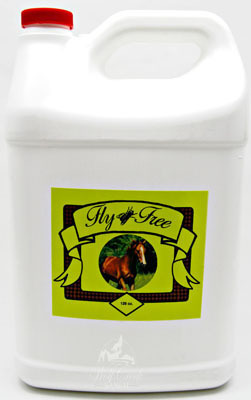 Fly Free works on ALL blood-feeding insects: biting flies, fleas, lice, mites, mosquitoes, and gnats. How does Fly Free work? Garlic is a detoxifier which goes to work internally in the blood. As it passes through the system, cleansing impurities in the blood, it emits an enzyme which shields the protein the female needs in order to lay eggs. The vinegar and other herbs contained in the liquid prevent it from going through the digestive tract, but direct it straight into the blood stream where fleas, mosquitoes, biting flies, and other insects feed. How long does Fly Free take to work? Depending on your pet's weight, metabolism, and infestation, along with the overall health of the animal, Fly Free can take as little as three days or as long as 4 weeks. The average length of time is 6 to 10 days. White animals take longest. Does Fly Free really work? Many people swear that Fly Free is the ONLY thing they have found to work on ALL pets. Can you use Fly Free with other vitamins and supplements? Absolutely! 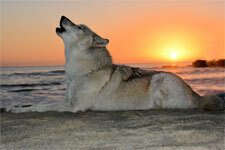 Fly Free can only enhance your pet's health and well being. Fly Free is safe and beneficial for ALL animals. Fly Free is all natural. It is a whole food item that does NOT contain chemicals, preservatives, artificial colorings, or flavorings. It is simply garlic, vinegar, citrus, and herbs essential for good health. One of the most frequently asked questions we get about Flea Free is about the use of garlic in the product. The internet is full of horror stories about the "toxicity" of garlic to pets. Please visit our "IS GARLIC SAFE FOR PETS?" webpage for information regarding the safe use of garlic. Garlic ~ is called "nature's antibiotic". Cleanses the liver to break down toxins in the blood. Garlic contains over 200 vitamins, minerals, amino acids, and enzymes. It is very healthy and also repels fleas, most mosquitoes, lice, mites, and flies. Garlic helps maintain a healthy heart and is excellent for the skin and fur. Citrus and herbs ~ are beneficial in supplying vitamin C, providing complex carbohydrates, and anti-oxidants. They also reduce free radical damage to tissue and organ systems. The herbs used are the ones found in your own kitchen cabinet, such as ginger. These herbs, along with the vinegar, help with digesting the Fly Free. They make sure that the Fly Free gets into your pet or large animals system so that it can work. Please temporarily disable your browser's pop-up blocker or you won't be able to order. The shopping cart uses a pop up window to display your purchase. IF you are ordering multiple small items, our shipping calculator may overcharge you for shipping. IF this occurs, we will refund the excess shipping charges when processing your order. If desired, you can call us (951) 674-0921 to inquire about the cost to ship multiple items. FLY FREE FOOD SUPPLEMENT ~ cannot be overdosed, but it is not necessary to give more than the recommended daily amount. Directions for Use: Small Animals: SHAKE WELL. Mix 1 Tablespoon of Fly-Free to 2 Quarts of pet's drinking water. Or add 1 Teaspoon into the food. You can pre-mix the formula and add to small caged pet water bottles. You can also use from a few drops to 1 tsp. daily in pet's food (judge by pet size). It will not hurt to use it in both water and food. Use each time you give your pets fresh water. Can premix (2 Tablespoons per gallon of water). Keep in a cool place out of the heat, room temperature or refrigeration is fine. Can be used on all pets and birds. Safe for pregnant and nursing pets. Garl-or3 Yard & Garden Spray spray in your yard, gardens, kennels, barns, etc. and watch the fleas, flies, mosquitoes, aphids, and other insects disappear! 10 Million Scanmask Spray Beneficial Nematodes (Steinernema feltiae) Garden Pack OR 25 Million Live Beneficial Nematodes Sc - Flea and Fly Exterminator OR 50 Million Ecomask Spray Flea Killing Beneficial Nematodes (Steinernema carpocapsae) can be sprayed into your lawn, garden, and moist soil areas. Beneficial nematodes parasitize soil dwelling larvae, such as fleas, flies, grubs, etc. whereas all other flea/tick/fly control methods only control adult insects, they do not affect larvae/eggs. Beneficial nematodes are essential for complete elimination of many pesky insects as they stop the hatching egg cycle.